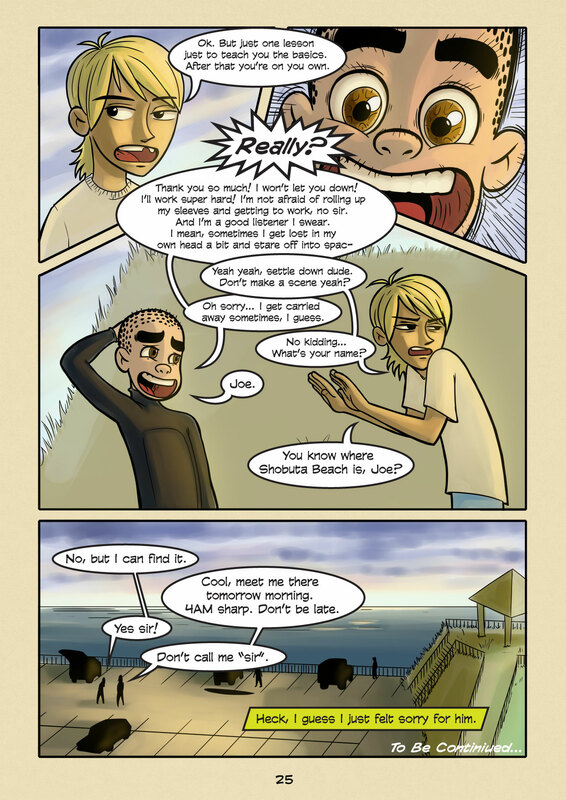 New Friends (#025) | Web comic "Surfer Joe"
At least in my experience. Sometimes I wonder why that is. I suppose it could have a bit to do with first impressions. You know when you start dating someone there is often a “honeymoon” phase where the person is perfect in your eyes. You see all their greatest qualities up front, it’s why you were attracted to them in the first place. But after some time the sheen wears off and you start to see the person’s faults. If things get bad enough their faults can even start to taint the qualities you were initially attracted to, and they can become faults in their own right. The magic is lost and your differences are too much to overcome. But for every Yin there must be a Yang. There are those you meet and instantly clash. Everything about then annoys and frustrates you… and the worst part is they won’t go away! But as time moves on you learn to accept each others differences, and you start to see each others quality. And many times I find the things that annoyed you before become some of their most endearing traits. Before you know it you are the best of friends, and often it is a bond that lasts a lifetime. Some of the most memorable people I’ve known I didn’t much care for at first. I believe that every person we meet are reflections of certain aspects of ourselves. Those we find grating are showing us parts of ourselves that make us uneasy, and for me personally that means people who are loud, open, passionate and vulnerable. Make no mistake, vulnerability is seen as weakness in modern culture. Even though it is often extolled as a virtue. We go to great lengths to keep our guard up in the form of social masks. We try to present ourselves as confident, witty and charming. We’re constantly working on how to present ourselves in the most appealing way possible, both physically and socially. Seriously, there are whole Youtube channels devoted to this. We have to seem like we’ve got it together. Or else we can’t manipulate the world around us to get what we want. We even weaponize out own vulnerability, pulling it out at the right timing for maximum sympathy results. Seems to me like an increasingly absurd game humans play. Those who refuse to play it are cast aside at best, chewed up and spit out at worst. Yet behind our masks we are all scared that we will be discovered for the insecure, needy, basket cases we actually are. And that is why people who don’t play the game scare us so much… They show us a side of ourselves we wish we could be. That is why they are my favorite people. We should all be so bold. On a lighter note, Chapter 1 is finished! Yay! I’m super happy to be moving on from the opening chapter. Even though it is necessary to set up the story, it was a bit of an emotionally taxing chapter to create. So many sad faces… so much seriousness! But now that the groundwork is in place it’s time to have some fun! We finally get to discover who these characters really are, and have some fun! I’ll be taking a little break to do some tidying up of the story and some development for chapter 2. Stay tuned for an update soon!